In 1958, on the eve of the revolution, Cuba ranked in the first, second or third place in Latin America with respect to its healthcare indicators. However, there were notable differences between the urban and rural sectors. In the last four decades, the Cuban government has successfully reduced those gaps. For example in 1959 there was only 1 rural hospital; by 1989 there were 64. In addition, Cuba has been able to maintain and even raise many of its health indicators to levels comparable to those of industrialized nations. Although there is no doubt that the Revolution has had a positive impact on healthcare, many gaps persist within regions, particularly with regard to availability of potable water and sanitation. Furthermore, during the economic crisis of the 1990s—during which the Cuban economy shrank by 30 to 40 percent—there were setbacks in many healthcare indicators, e.g., sanitation, food consumption, and, to a lesser degree, morbidity. This paper is divided into four parts. The first is an overview of the evolution of the healthcare system and its organizational structure. The second describes the policy and inputs of the healthcare system. The third analyzes the performance of the system over the past four decades. And the fourth compares Cuba with other countries in Latin America with regard to seven health indicators and evaluates Cuba’s health care system. According to many scholars, Cuba’s health ideology and organization are not purely the results of the socialist nature of the revolution (Feinsilver 1993, Figueras 1998). Many precursors can be found in the pre-revolutionary health ideology. “Mutualism,” a prepaid health plan much like the health maintenance organizations in the United States during the 1970s, were widespread in Cuba during the 1930s to the 1950s (Feinsilver 1993; Macdonald 1999). These mutual-aid societies provided comprehensive medical services for their members. In 1958 there were over 100 mutual aid clinics and cooperatives. However, they were mainly concentrated in Havana and other large cities like Santiago de Cuba, Cienfuegos, Camagüey and Santa Clara (Mesa-Lago 2002). Cuba differs from other socialist countries in the way it began its allocation of health services. Other nations initially provided health services for the industrialized urban labor force. Because rural areas were neglected and suffered the worst health indicators, the Cuban government initially concentrated on providing health care to the rural sector. On January 23, 1960, the Rural Health Service was established. “This service required all medical school graduates to serve for one year in the rural areas upon graduation and provided for the creation of rural health facilities. In 1961 a rural dental service was added” (Feinsilver 1993, 32). In 1961 the Ministry of Health and Welfare was replaced by the Ministry of Public Health (MINSAP). The new Ministry’s role was to oversee the three types of organizations that existed in the health sector: public, mutualist, and private. In 1960, the public health system initiated the process of providing coverage for the total population, coexisting with the mutualist and private sub-sectors. By 1961, the government had lowered the price of medicines, nationalized pharmaceutical companies, private hospitals, and mutualist cooperatives as well as expanded the network of medical institutions so that the Cuban National Healthcare System (SNS) had become totally socialized (Bravo 1998; Mesa- Lago 2002; Sixto 2000). The nationalization of mutual- aid coops and private hospital provoked the exodus of nearly two thirds of all medical professionals (2,000 out of 6,000 physicians left). This brain drain had a significant impact on many outputs of the Cuban healthcare system in the first half of the 1960s (for example the infant mortality rate increased from 33.4 in 1958 to 46.7 in 1969). During this period, many of the policies of the previous stage were intensified and new policies implemented, specifically the establishment of policlinics (primary healthcare providers) and the creation of the Community Health Program. The goal of the Cuban government in 1959 was to “remedy the inequalities in healthcare and to establish a rapid, transitional, free, and comprehensive national service that reaches urban, rural and mountainous populations in all 6 provinces,” hence, policlinics, regional medical units and provincial hospitals were developed (Danielson 1979, 130-132). By 1964, most health centers were transformed into policlinics. These policlinics were organized as the basic Cuban unit of health services, while the larger hospital units continued to be providers of second and third level care (Danielson 1979, 165). Under the policlinic program, all residents within a given zone have the same physician (MINSAP 1999). This ideally promotes a better understanding of patients and their environment by physicians. Doctors and other healthcare professionals worked in conjunction with neighborhood communities. This “team approach” became the basis of the community health program. Cuba’s system used the team approach to provide preventive and curative health care through an integrated national health system with the active participation of the communities served (Feinsilver 1993). Doctor and nurse teams had to attend patients in the policlinic, as well as at home, school, day-care, and even the workplace. In 1976, the nation was divided and organized into 14 provinces and 169 municipalities. The MINSAP was placed under the Council of Ministries and the organs of direction of the state (MINSAP 1999). Even though the community health program was well organized, it had many setbacks. For example, care in the community was supposed to focus on prevention. According to Feinsilver, the problem was that this program did not allow medical teams to know their patients on a personal basis and often preventive care and follow-up visits were not provided. To make the situation worse, patients crowed emergency rooms at hospitals where they believed they could receive better treatment, thereby making it harder for policlinics to offer care (Feinsilver 1993, 40). In an effort to correct the problems associated with the policlinic and the community health program, the Cuban government later established the Family Doctor Program. In 1983, the National Assembly enacted the Public Health Law, which laid out state activities to provide healthcare to all Cuban citizens. The law designated MINSAP as the steering agency of the national health system and specified the services it would carry out, in addition to determining the functions of local health authorities. The National Health System (NHS) is the only system operating in the country; it is comprehensive, regionalized and decentralized. The NHS is organized in three levels (see Figure 1). The MINSAP represents the national, highest level, and serves as the steering agency. Directly under the MINSAP are university centers, medical research centers, and the medical-pharmaceutical production and distribution industry. 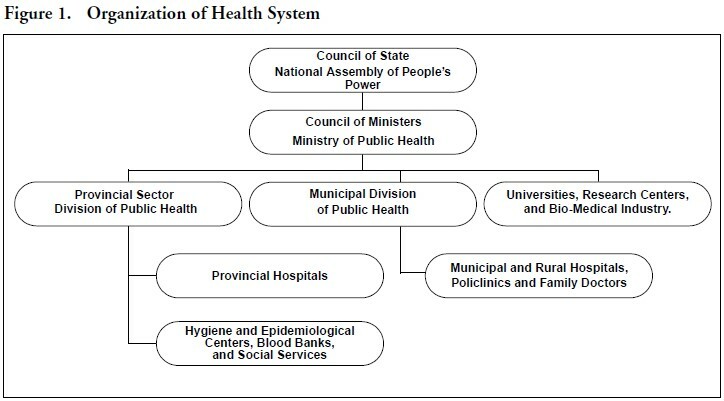 The second level corresponds to “the Provincial Public Health Offices… which are under the direct financial and administrative authority of the provincial assemblies” (PAHO 1999, 3). Below the provincial governments are the provincial and inter-municipal hospitals, blood banks, provincial health and epidemiology centers, and training centers for health professionals. The third and lowest level is the municipal one. The Municipal Public Health Offices oversee policlinics, rural, local and municipal hospitals, oral health clinics, social welfare institutions for the elderly and persons with mental or physical disabilities, maternity homes and other establishments. In 1984, Cuba initiated the Family Doctor Program, whose goal was to place a doctor and a nurse team in every neighborhood. This program was designed to project the health system’s resources further into the community than the previous systems had been able to do (MINSAP 2000). By 1985, the Family Doctor Program already served 1.3 million people. Preliminary results indicate it has reduced cost through decreased hospitalization and emergency room use. Rates of hospitalization have been cut drastically since 1985. Preventive medicine sharply reduced many diseases. “Keeping people from becoming ill cost only a tenth of treating them once they have become sick” (MacDonald 1999, 141). The family doctors are also having vast effects on rural health, however because the population is dispersed throughout the countryside, the doctor and nurse teams must continually visit homes, farms, and sugar mills, making the program costly; inefficiency has also plagued the urban areas because of well-established policlinics (Feinsilver 1993, 46). The Family Doctor Program “has been criticized in the First World for leading to the trivialization of medical practice and for failing to provide doctors with sufficient variety and complexity of cases to maintain their medical knowledge” (Feinsilver 1993, 46). The program is also very costly and inefficient; however, it has impressed health officials, researchers, international organization personnel, and politicians from the developing world (Garfield and Sloan 1997; Garfield and Holtz 2000). In 1991, with the collapse of the Soviet Union, a severe economic crisis occurred and a “Special Period in Time of Peace” began as a euphemism for an emergency crisis program. The termination of Soviet and CMEA aid as well as drastic reduction of trade led to the decrease of GDP by 35 to 40 percent. In 2000, GDP was still 18 percent below the 1989 level (Mesa-Lago 2002). The crisis had a negative impact on the importation of medical equipment, spare parts and medicines. The lack of supplies accompanied by a deterioration of basic infrastructure (potable water and sanitation) resulted in a setback of many of the previous accomplishments. The strengthening of the U.S. economic embargo in the second half of the 1990s contributed to these problems. Starting in 1997, the government implemented many austerity measures along with various organic food and herbal medicine programs. By 2000, many of the indicators that had deteriorated had seen some improvement, (e.g., the percent of children born underweight, which increased from 7.3 in 1989 to 9.0 in 1993, decreased to 6.1 in 2000.) However, many inequalities among provinces arose, particularly in income distribution (due to family remittances), food consumption and basic health indicators. The National Health System is completely financed by state resources. It is also highly decentralized: 92.4% of expenditures for public health are financed from municipal budgets. The government’s national budget allocation for health rose nearly 35 times, from 51 million pesos in 1960 to 1,857 million pesos in 2000. In the 1990s, health sector expenditures exhibited a rising trend, from 98 pesos per capita in 1990 to 166 pesos per capita in 2000, an increase of 69 percent (see Table 1). However, the real value of those expenditures was severely reduced by inflation. (The series between 1976-89 and 1989-99 cannot be technically connected because they have different base years.) 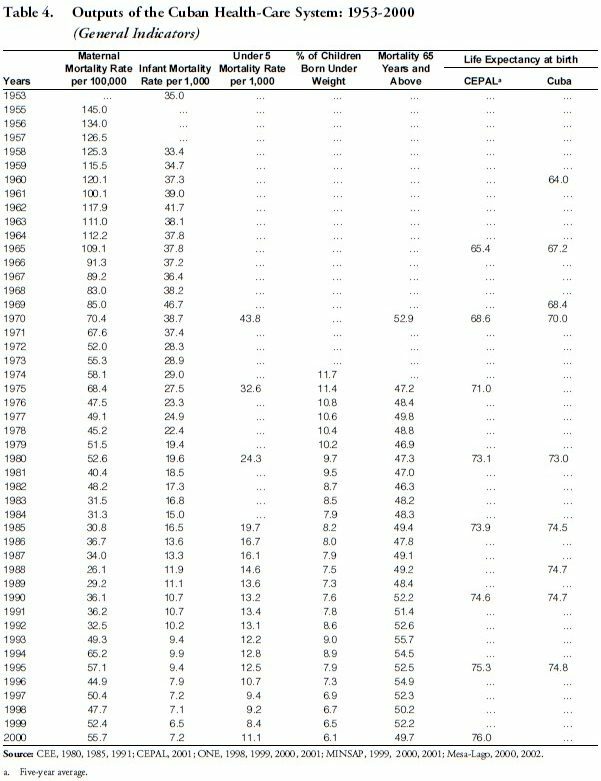 Real expenditures increased from 34.7 to 91.1 pesos in 1976-1989, but declined from 65.3 to 44.4 pesos in 1989-1999 (Table 1). In 1989 the Cuban government spent US$227.3 million in the importation of health-related products, but that amount was reduced to US$67 million in 1993; although such imports rose to US$112 million in 1997, they were still half their value before the crisis (MINSAP 1999). In 1997, 38 percent of the healthcare budget was assigned to primary care and 46 percent to hospital care. Of the total health budget, 50 to 54 percent was spent on salaries (Figueras 1998). However, since the early 1990s, there has been a sharp decline (15 percent in 1990- 94; 3.1 percent in 1997) in the expenditures on the maintenance and construction of basic health sector infrastructure, as well as on hospitals and policlinics (MINSAP 1999). The lack of investment in water and sanitation has contributed to the increase of contagious diseases (see below). Thus, “the out-of pocket expenditures assumed by families include drugs prescribed on an outpatient basis, hearing, dental, and orthopedic processes, wheelchairs, crutches, and similar devices, as well as eyeglasses” (PAHO 1999, 7). Many families spend over 400 pesos a month on these items while the average monthly salary in 2000 was 234 pesos (ONE 2001; Sixto 2001). Since the early 1960s, Cuba has had a high dependence on external capital to finance its healthcare system. In 1960-90, the Soviet Union provided about US$65 billion in aid and loans, which allowed the release of funds for healthcare. In addition, most equipment and inputs for the health system and the production of medicines were imported from the USSR and CMEA. With the collapse of the socialist camp, a severe vacuum occurred (Mesa-Lago 2000). In 1995, the Pan American Health Organization (PAHO)/World Health Organization (WHO), the United Nations Population Fund, the United Nations Development Program (UNDP) and UNICEF lent US$3 million to Cuba; they provided another US$20 million annually in humanitarian aid during the 1990s. Basic to a healthy population are access to potable water and sanitation. The Cuban government has made a significant effort to improve the access to potable water throughout the island and since the 1960s, has been successful in reducing the urban-rural gaps. 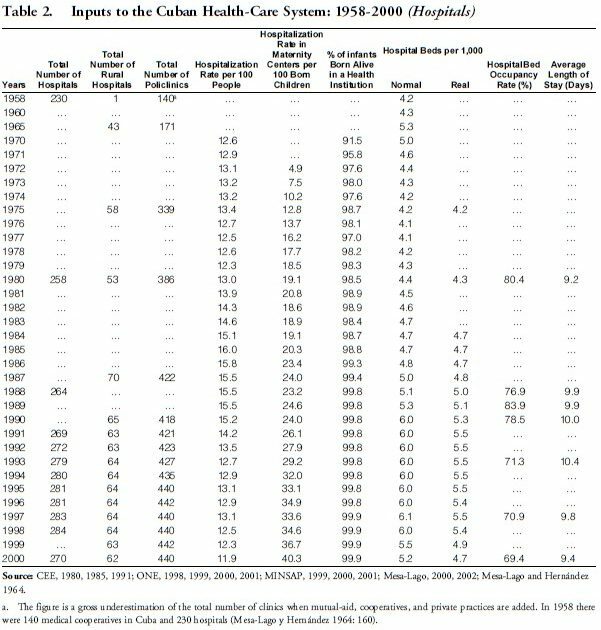 In 1970, 56 percent of the total population had access to safe drinking water; in 1980, it had increased to 74.1 percent, in 1989 to 89.0 percent, and in 1999 to 92 percent (see Table 1). However once the definition of potable water is broken down by source and quality, the urban-rural gap rises considerably. For example, in 1981, 89.8 percent of the urban population had access to safe water, while only 32.9 percent in the rural sector. In addition, the vast majority of the rural dwellings were considered as having “easy access” to water, that is, the water was available outside the dwelling. With the decline of the Cuban economy in the 1990s, the country’s ability to produce chlorine declined, reducing the population covered by chlorinated water systems from 98 percent in 1988 to 26 percent in 1994. The proportion of the population without potable water increased from 10 to 12 percent in the period 1990– 1994 (Garfield and Holtz 2000). By 1994, the proportion of the population with water connections to their dwellings declined to 81 percent in urban areas and to 24 percent in rural areas (Garfield and Holtz 2000). In 2000, 83.7 percent of the urban population had access to water in the dwelling compared to only 40.5 percent of the rural population. The access to safe water through “easy access” outside the dwelling and of public service in the rural sector had been reduced by nearly 55 percent of the population (Mesa-Lago 2002). Of the total volume of water supplied to the population, “72% is of underground origin, and 28% is from surface sources; 68.3% of the population (7.5 million) receives water from aqueducts” (PAHO 1999, 216). The rest of the population is served by tank trucks and other means. Access of the population to sanitation increased from 43.8 percent in 1970 to 90 percent in 1990. In 2000, 97 percent of the urban sector had access to sanitation, compared to 83.7 percent in the rural sector; out of the latter, 90 percent relied on septic tanks and outhouses. In 1997, the rural-urban disparity was 74 percent with respect to potable water and 80.7 percent regarding sanitation (CIEM 1997, 55 and 57 as cited by Mesa-Lago 2002, 15). These figures are relatively low compared to Latin America. Along with the infrastructure of sanitation and potable water, healthcare facilities are fundamental for the provision of services to the population. One specific indicator of the distribution or accessibility of healthcare facilities is the number of rural hospitals and policlinics. In 1958, there was only one rural hospital on the island, while by 1997 there were 64. Many of them were very poorly equipped and maintained, however (Garfield and Holtz 2000). In 1958 there were 58 policlinics, compared to 440 in 1997 (see Table 2). Another measure of access to healthcare is the distribution of clinics. In 1970, there were 3.4 clinics per 10,000 inhabitants on the island. With various programs to distribute the number of doctors and their clinics all over the island (Family Doctor Program), the number of offices grew to 7.2 in 2000. 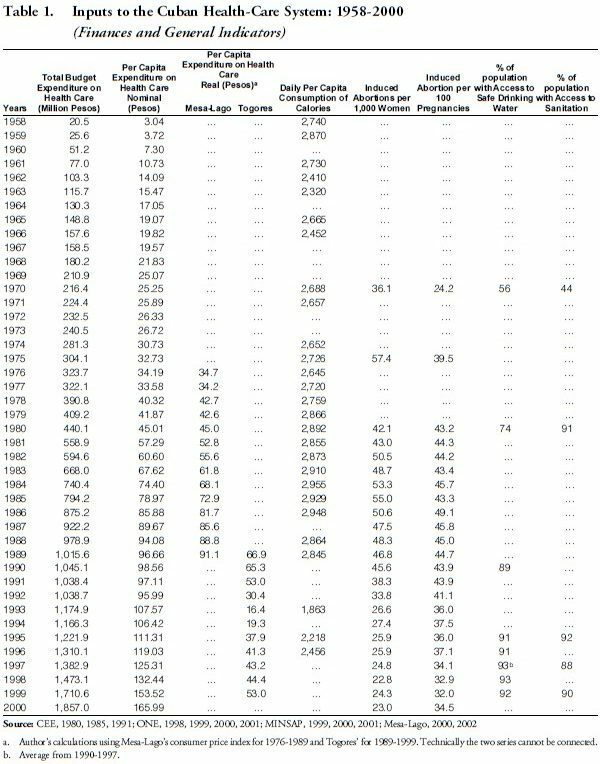 With more offices, clinics, and hospitals available to the population, the percentage of people born in health institutions increased from 91.5 in 1970 to nearly 100 percent in the late 1980s (see Table 2). 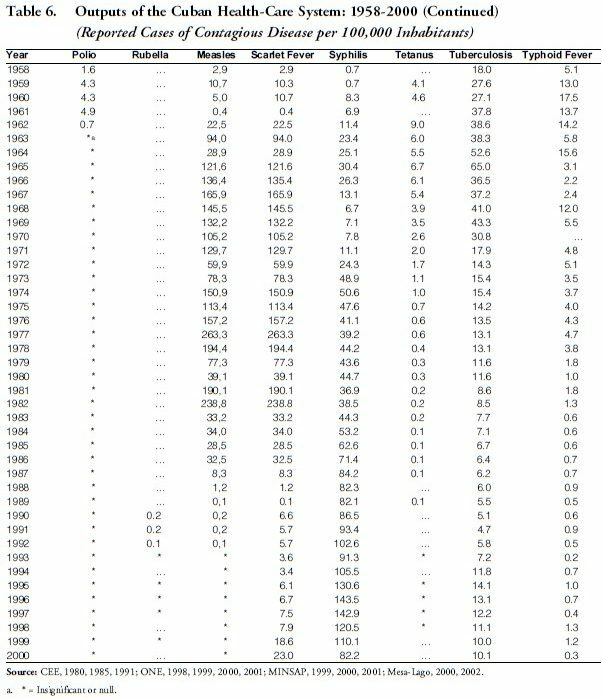 The hospitalization rate per 100 people rose from 12.6 in 1970 to a peak of 16.0 in 1985; the rate then dropped in the next 15 years to 11.9 in 2000 (see Table 2). Some scholars attribute this decrease to the family doctor program (Feinsilver 1993; Figueras 1998; and McDonald 2000). The number of medical hospital beds per 1000 inhabitants increased from 4.2 in 1958, to 5.3 in 1965 and 6.1 in 1995. However, many of these beds were not being occupied and were costing too much. This led the government to close down some health centers, hence, the rate of medical hospital beds per 1000 inhabitants declined to 5.2 in 2000. Mesa-Lago has estimated that the “real average number” of beds per 1,000 inhabitants rose from 4.2 in 1975 to 5.5 in 1990 and then decreased to 4.7 in 2000 (Mesa-Lago 2002). Even with the reduction of beds, the occupancy rate decreased significantly in 1980-2000, from 80.4 to 69.4 percent (Table 2). This inefficiency costs the government significant funds that can be better allocated to other areas badly in need of resources. Historically, the number of physicians in Cuba has been substantially high, particularly in relation to Latin American countries. Thus in 1958 there were 9.2 physicians per 10,000 inhabitants. Because of the exodus of 2,000 physicians, the rate dropped to 5.4 in 1962. With an increase of enrollment in medical schools at universities, the rate reached 10.0 in 1975 and 36.1 in 1990. Even in the midst of the economic crisis, the number of physicians and the rate continued to grow to 58.2 in 1999 (see Table 3). During the 1980s and until 1994, the number of medical school graduates rose, but in 1995-2000 it declined by 61 percent. While 4,780 medical students graduated in 1993, only 1,840 did so in 2000. The number of medical students enrolled also declined from 36,660 in the school year 1994/95 to 25,311 in 1997/98. To date, the decline in graduates has not affected the number of doctors; however, as rates of enrollment and graduation continue to decline, as also do mean salaries and incentives, the number of physicians is sure to diminish. Because there is a large surplus of doctors in Cuba, and they are not allowed to work in private practice, many doctors opt to find other occupations, particularly in the tourism sector and providing services such as taxi drivers. Cuba also improved its rates of dentists per 10,000 inhabitants over the past 40 years: from 1.5 in 1965 to 8.9 in 2000. The same trend is evident in nurses: from 1.9 in 1958 to 74.3 in 2000 (See Table 3). After Cuba and the United States ended all diplomatic relations in 1961, the Soviet Union became Cuba’s primary supplier of medical equipment and medicines. The Soviet Union provided 94 percent of Cuba’s imports of medical equipment in 1961-1988. After the collapse of the Soviet Union, Cuba’s imports of medical equipment and medicines dropped dramatically. During the worst part of the economic crisis of the 1990s, Cuba had a severe lack of medicines. The supply of raw materials required to produce 85 percent of all drugs consumed in Cuba was halted with the collapse of the Soviet Union, resulting in the lack of 300 medicines (Mesa-Lago, 2000, 324). MINSAP began directing physicians to conserve and control the existing medicines for the neediest. The government also resorted to the use of alternative medicines. Because Cubans do not have a strong traditional reliance of herbal medicine, it was not an easy task to persuade the population to use alternative medications (Barrett 1993, 3). The oil shortage caused by the collapse of the Soviet Union—the Soviet Union supplied 92 percent of Cuba’s total fuel consumption in 1989—also affected the healthcare system. Soviet supply of crude oil fell 61 percent, from 7.8 million tons in 1987 to 3 million tons in 1995, while the supply of oil derivatives decreased by 52 percent (Mesa-Lago 2000, 332). As gasoline supplies ran low and spare parts became scarce, ambulances and other health-related transportation equipment became idle. Furthermore, the supply of electricity fell tremendously, so that the hours of laboratory and clinical operation were cut drastically. Sanitary conditions also deteriorated because of lack of gasoline needed to fuel garbage trucks. The number of operating garbage trucks declined from 200 to 99 in Havana, and infrequent pickups resulted in garbage piling up and the spread of rats (Mesa-Lago 2000). As an analyst observed, “piles of refuse were common in Havana’s streets as it remained uncollected for months” (Barrett 1993, 2). With the cut of Soviet aid and subsidies, the Cuban government also had no choice but to significantly expand food rationing: “rationing expanded to virtually all consumer goods in 1991-1994, and out of 20 products, the quotas of 17 had been cut or shifted from free distribution to rationing. A total of 28 food products and 180 consumer goods that were ‘free’ became rationed. The situation deteriorated further in 1993-1994 when rationing provided only half of the monthly food minimum requirements” (Mesa- Lago 2000, 336). 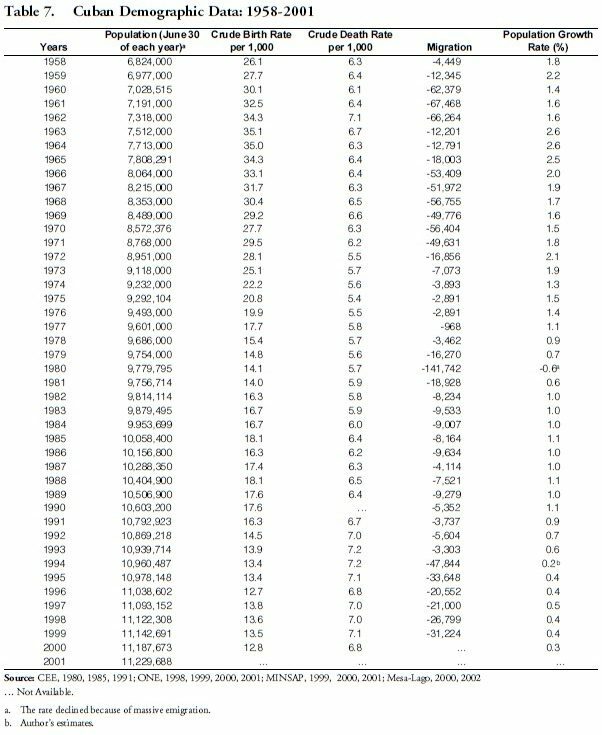 The per capita consumption of calories, which was at an all time high of 2,897 calories per day in 1980, severely dropped to 1,863 in 1993; it partly recovered to 2,456 in 1996, still well below the 2,740 of 1958 (See Table 1). Per capita consumption of proteins also dropped from 77.9 grams per day in 1988 to 46.0 in 1993 (Garfield and Holtz 2000). Insufficient calories and proteins contributed to an increase of the percent of children born with low weight (under 2,500 grams), from 7.3 in 1989 to 9.0 in 1993 (See Table 4). Because of the situation explained above, the government implemented several programs in an attempt to maintain health standards. The first and most important was a reorientation toward primary healthcare and a strengthening of infant and maternal care. According to MINSAP, these two groups of the population were the two that required the most funding and care (MINSAP 1999). Between 1990 and 2000, the hospitalization rate in maternity centers per 100 born children nearly doubled from 24.0 to 40.3 (see Table 2). The same trend is evident in the rate of visits per 1,000 inhabitants under 1 year of age to pediatric doctors, which doubled from 20.8 to 42.4. Another important achievement of the revolution has been the provision of almost universal vaccinations (95%), which began in the late 1960s. 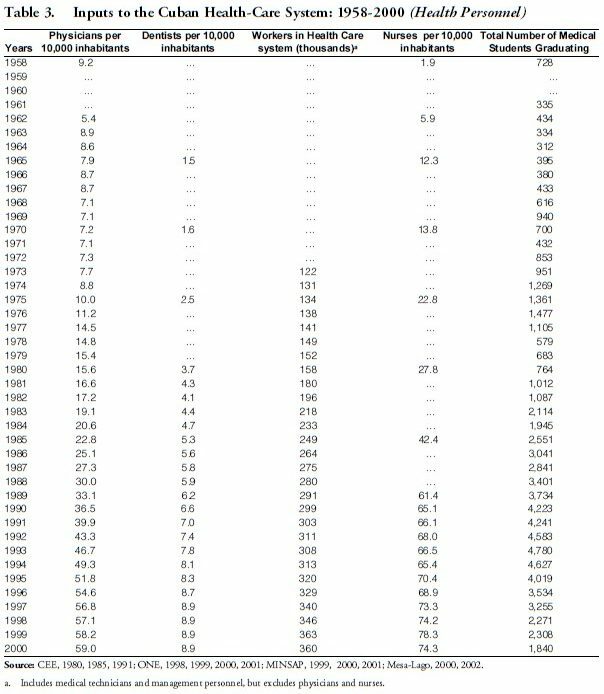 In 1970-1975 a significant increase in all vaccinations took place, but the numbers began to drop in the early 1980s and even further during the decade of the 90s (see Table 5). In 1970-1996 for BCG,2 Duplex and Triple DPT3 vaccinations decreased by over 50 percent. Although Cuba’s vaccination program has helped eradicate many contagious diseases (polio, diphtheria, tetanus, and rubella), in 1991-1996, with the decline of vaccination and a deterioration of sanitation and the basic infrastructure, some diseases have increased, e.g., tuberculosis, hepatitis, acute diarrhea, and chicken pox (See Table 6). In the 1950s, Cuba already had the lowest infant mortality rate in Latin America: 35 per 1,000 in 1953 and 33.4 in 1958 (See Table 4). In the first decade of the Revolution, the rate increased to 41.7 in 1962 and 46.7 in 1969. This increase was partly due to the exodus of thousands of doctors from the island and the decrease in imports of medicines, which led to a raise in morbidity. Another reason for the increase was an improvement in the reporting and registration of deaths. In the 1970s, the Cuban government launched a campaign to reduce the infant mortality rate, which eventually led to a rate lower than that in the United States. This campaign was directed at maternal and prenatal care. In 1981- 1994, there were 1,381,539 prenatal tests in which 1,863 defects of the neural tube and 1,056 other birth defects were diagnosed. In addition, mothers receive an average of 12 checkups during gestation and more than 90% begin their medical visits by the first trimester. Additionally, 97% of children are breastfed upon their discharge from maternal centers, while 70% continue to be breast-fed for four months (Dieterich 1998). By 1984, the infant mortality rate had decreased to 15 and was lower than in most of the third world, but Cuba continued its effort to cut the rate, which reached 10.7 in 1990. The rate increased from 9.4 in 1993 to 9.9 in 1994 “due to deteriorating social conditions and medical facilities infant mortality rose slightly, owing to an increase in deaths caused by respiratory and diarrhoeal diseases”( Garfield and Holtz 2000, 118). The decline was reversed by 1995 and in 1999, the rate declined to a historical low of 6.5. In 2000, there was an increase again to 7.2. 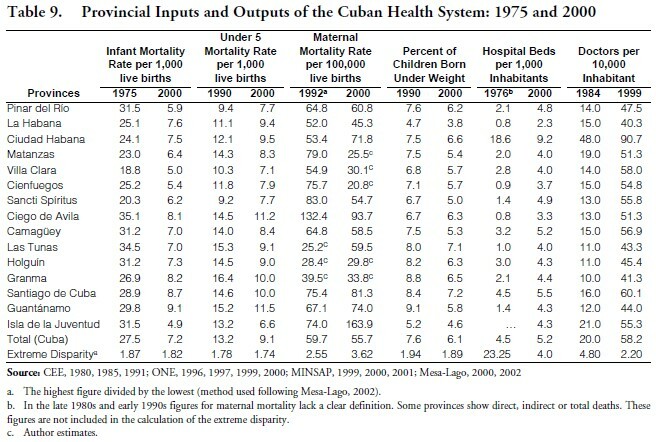 Cuba’s infant mortality rate was reduced 78 percent between 1958 and 2000 (see Table 4). One wonders why the government did not redirect its significant expenditures to further reduce such a low infant mortality towards other areas in desperate need of resources, such as sanitation or potable water in rural areas. This inefficient allocation of resources will cost Cuba in the future and trying to lower the infant mortality rate even more will have diminishing returns. Also missing from the conventional analysis of Cuba’s infant mortality reduction is its staggering abortion rate, which, because of selective termination of high-risk pregnancies, yields lower infant mortality rates. Cuba’s abortion rate was 55.0 per 1,000 women in 1985 but declined to 45.6 in 1990 and 22.8 in 1998. When the abortion rate is reported per 100 pregnancies, the significance of these procedures increases. In 1970, the rate was 24.2; it increased to 49.1 in 1986 and by 1999 had declined to 32.0. Although the Cuban government has been successful in reducing the abortion rate through sexual education and contraception use, it still is among the highest in Latin America. Cuba’s life expectancy has always been one of the highest in the region, but there is not a single series for 1958-2000 published by Cuba. 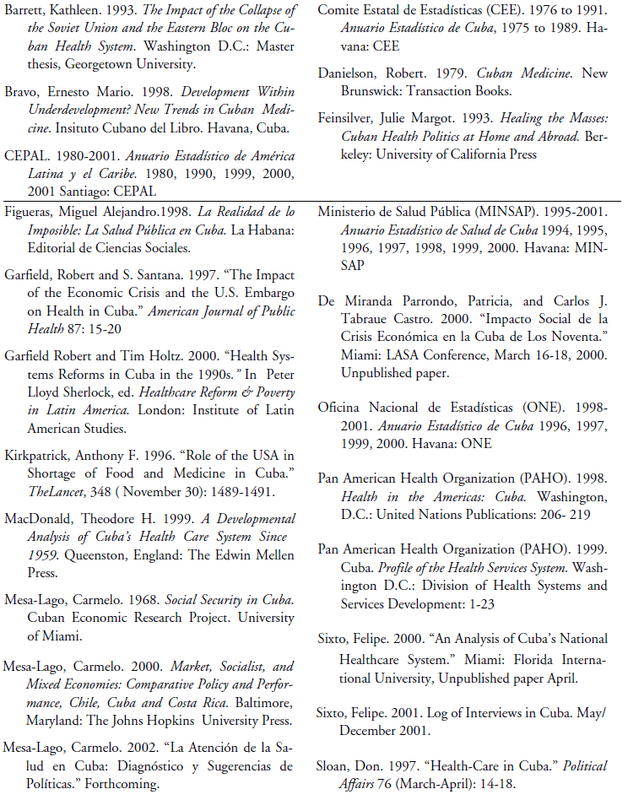 Table 4 shows a series from CEPAL and another from Cuba; the former is more complete than the latter. CEPAL publishes its figures in five-year intervals. According to CEPAL, in 1960-65, the life expectancy was 65.4, increasing to 73.9 in 1980-85 and to 76 in 1995- 2000. Such increase can be attributed to the significant improvement in health standards in the last four decades. The maternal mortality rate decreased from 125.3 in 1958 to 26.1 in 1988. During the crisis of the 1990s, the lowered level of caloric intake caused an increase in maternal mortality to a peak of 65.2 in 1994. Lack of a clear definition of reported maternal mortality rates during the late 1980s and early 1990s creates a significant inconsistency in the data. Along with maternal mortality rate, the lowered level of caloric intake caused the percent of children born under weight: to rise from 7.3 in 1988 to 9.0 in 1993, but it decreased to 6.1 in 2000 (see Table 4). The crude death rate in Cuba has been rising over the last decade due to the aging of the population: 5.5 per 1,000 in 1976, the lowest, and 7.2 in 1994, the peak; in 2000, it was 6.8 (see Table 7). Cuba has the second oldest population in Latin America and by the next decade will surpass the leading country, which is Uruguay. The aging of the population has been caused by 3 factors among others: (1) declining birth rates: from 26.1 in 1958 to 12.8 in 2000; (2) decrease of the population growth rate, 2.6 in 1964 to 0.3 in 2000; and (3) migration of the population, mainly between ages 24 and 42. There was a decline in mortality among the population over the age of 65 from 52.9 to 46.3 in 1970-1982, an increase to 55.7 in 1993 (due to the economic crisis) and a decrease to 49.7 in 2000, still higher than in 1982 (see Table 4). The principal cause of death over the last three decades was heart disease: 147.9 deaths per 100,000 inhabitants in 1968, increasing to 180.3 in 2000 (See Table 8). The other leading causes of death in 2000 were malignant neoplasm (146.5), cerebrovascular disease (72.9), and influenza (46.2). In 1993 and 1994, mortality from infectious and parasitic disease increased dramatically due to the deterioration of quality of potable water and sanitation: from 8.7 in 1986 to 13.8 in 1993; by 2000 the outbreak had been controlled and the rate declined to 5.5. Cuba has been very successful in reducing rates of many contagious diseases: polio, tetanus and diphtheria have been eradicated. 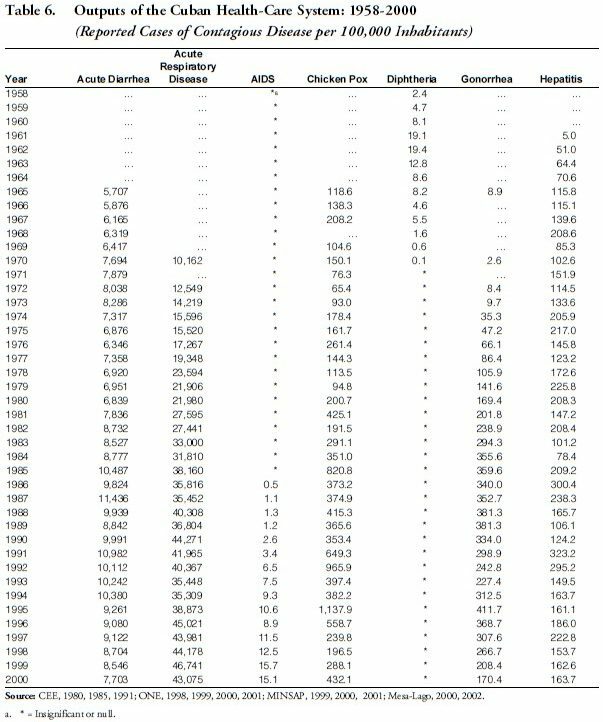 However, in the 1990s many diseases that previously had been significantly reduced increased again, including acute diarrhea, chicken pox, hepatitis, tuberculosis, typhoid fever, acute respiratory diseases and sexually transmitted diseases (STDs) like syphilis, gonorrhea and AIDS (See table 6). Diseases like acute diarrhea and tuberculosis increased dramatically due to the lower levels of sanitation and clean water. Acute diarrhea jumped from 5,707 to 10,242 in 1965-1993; it decreased to 7,703 by 2000. Tuberculosis rose from 4.7 in 1991 to 14.1 in 1994; it declined to 10.1 in 2000. Acute respiratory diseases are by far the leading causes of morbidity in Cuba the rate per 100,000 inhabitants increased four-fold in 1970-2000. In 1997, respiratory diseases caused about 5 million medical visits. In the past three years, the number of children and senior citizens infected with respiratory diseases has increased (PAHO 1999, 209). Because of the increase in prostitution and lack of prevention, STDs have increased significantly. Between 1986 and 1996, 1,468 cases of HIV-positive individuals were detected; of these, 381 died and 534 developed AIDS. The 15-24 age group is the most affected; 65 percent of the infected males are homosexuals. The majority of the individuals acquired the disease in Cuba (PAHO 1999, 210). The incidence of HIV/AIDS rose from 0.5 to 15.1 per 1,000,000 inhabitants in 1986-2000. Over the past four decades, Cuba has had many accomplishments in the area of health care, including: (1) expansion of access to nearly 100 percent of the population; (2) increase of its health indicators to levels comparable with industrialized nations, with infant mortality rate among the world’s lowest; (3) the creation of a large pool of health services personnel, many of whom have been exported around the world to assist foreign governments with their health problems; (4) reduction in urban-rural differences; and (5) eradication of many diseases, particularly polio, diphtheria, rubella and tetanus. Although Cuba has performed very well in relation to other Latin American countries, its healthcare system faces many problems, including: (1) high and increasing cost in relation to GDP; (2) inefficient allocation of resources; (3) excess hospital beds and low occupancy rates; (4) excess doctors and extremely low wages; (5) deterioration of basic infrastructure; (6) scarcity of medicines and other medical inputs, as well, equipment and spare parts; and (7) remaining urban-rural and provincial disparities. 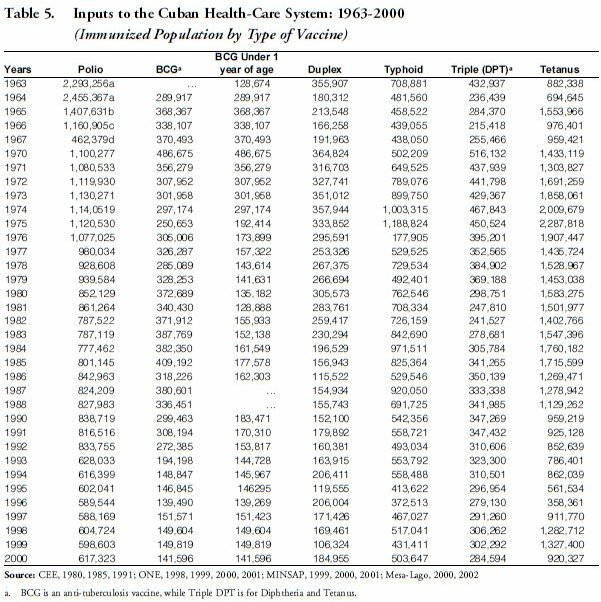 As can be seen in Table 1 Cuba’s total budget expenditures for health care have increased continuously throughout the last four decades. However, once inflation is taken into account, the purchasing power is lowered considerably: in 1976 the real per capita expenditure was 34.7 pesos and steadily rose to 91.9 in 1989. As we have noted, however, this series ends in 1989. Using a different series that begins with 1989, real per capita expenditures fell from 66.9 to 16.40 in 1989-93 due to rising inflation, climbing to 53.0 in 1999, well below the figure for 1989. In 1989-2000, the share of GDP allocated to healthcare increased from 4.3 to 6.1 percent. This was a period, however, when GDP declined from 35 to 40 percent. Since 1995 GDP has increased, however the cost of healthcare continues to grow at a much higher rate (Mesa- Lago, 2002). Cuba has had the lowest infant mortality rate in Latin America since the 1950s. In 2000, it was one of the lowest in the world at 7.2 (see Table 4). However, the government continues to make prenatal and infant care its priority and allocates considerable resources to this program. The government should reallocate these funds into areas more in need, such as water and sanitation infrastructure, an inefficiency that misuses large resources (Mesa-Lago 2002; Sixto 2000). Another area to which Cuba has allocated excess resources is hospital capacity. Even with the decrease from 6.0 hospital beds per 1,000 inhabitants in 1998 to 5.2 in 2000, occupancy rates continue to be low and show a declining trend. Hospital bed occupancy has decreased since 1980 from 80.4 percent to 69.4 percent in 2000. This rate is low by international standards (See Table 2). Since the early 1960s, Cuba has been recognized as a third world medical power for its number of doctors. The rate of doctors per 10,000 inhabitants increased dramatically since the mid-1970s to 58.2 in 1999. Cuba has a large surplus of doctors and these doctors are not allowed to practice their professions in the private sector. After the crisis of the 1990s, the purchasing power of a doctor’s salary is about US$15-20 per month. Because of these conditions, many doctors opt to work in a different occupation—usually in the informal sector as taxi drivers, earning 50 to 60 times more than in practicing their profession as doctors (Garfield and Holtz 2000; Sixto 2000). The same situation is evident for dentists and nurses. In the 1990s, the economic crisis was “associated with a reduction in the materials and products needed to ensure clean water” (Garfield and Holtz 2000). The country’s sanitation and infrastructure were severely impacted. Disease associated with lack of sanitation and poor nutrition increased. Moreover, the infrastructure of facilities such as hospitals and policlinics deteriorated sharply. Ironically weakening of the hospital system resulted in more, and relatively longer, hospital stay. In 1989-1993, the average length of stay at hospitals increased from 9.9 to 10.4 days, although it decreased to 9.4 in 2000. However, this figure is still high for international standards and should have been lowered with the family doctor program and the expansion of family clinics. As Table 9 demonstrates, gaps still exist between provinces. For example Guantánamo had an infant mortality rate of 9.1 in 2000 while Villa Clara’s rate was 5. In Ciudad Habana, there were 90.7 doctors per 10,000 inhabitants in 2000 and 41.3 in Granma. Although these gaps have narrowed since previous years, the gap in maternal mortality has increased. The extreme disparity increased from 2.55 in 1992 to 3.62 in 2000 (see Table 9). It must be noted however, that these figures are much lower than the rest of Latin America (Mesa-Lago 2002). When compared to the rest of Latin America, it is evident that Cuba has gone through great lengths to improve its healthcare system and its corresponding indicators. As Table 10 illustrates Cuba has increased in ranking in three of the five indicators in that table. However, for infant mortality rate, Cuba was already ahead of the region in the 1950s. As explained earlier Cuba has a surplus of hospital beds and doctors, causing inefficient utilization. Other Latin American countries have not increased the absolute numbers of doctors or of hospital beds but have been able to find equilibrium between the supply of each and the demand. The area where Cuba has declined significantly is consumption of calories. Cuba has dropped seven places. Cuba has been praised by many for its improvements in healthcare through the last four decades. In fact, many believe that Cuba has become a world medical power providing a model for the developing world (Bravo 1998; Figueras 1998; MacDonald 1999). While much of this is true, Cuba faces several problems associated with its healthcare system. The Cuban government can significantly reduce the effects of the problems listed above if reforms are implemented. However, many of these reforms must be more market oriented. First, the Cuban government must make the system more efficient by investing in preventive medicine. It must also allocate funds to the building and maintenance of infrastructure and sanitation. It is essential that the government close hospitals where bed occupancy rates have fallen below efficient levels. Second, the government must establish some type of “escape valve” to permit doctors to take part in the new private sector of the economy. Third, the remaining disparity between the urban and rural sectors and provinces should be corrected. And fourth, reform of the finance of the system must take place to ensure its sustainability. 1. This paper has been published in Spanish by the Friedrich-Ebert-Stiftung foundation and Nueva Sociedad. I am deeply indebted to Carmelo Mesa-Lago for assistance throughout all stages of this paper. I am also thankful to the Florida International University’s Cuban Research Institute for funding my field research in Cuba. 2. BCG is an anti-tuberculosis vaccine. 3. Triple DPT is a vaccine against diphtheria, whopping cough and tetanus.